An International Scouting Pennant awarded by the staff of Gilwell Park, the main Scout Training Centre located on the edge of the Epping Forest, Chingford, north London, UK, to the Kauri Troop from New Zealand for their high camping standards while at the park. 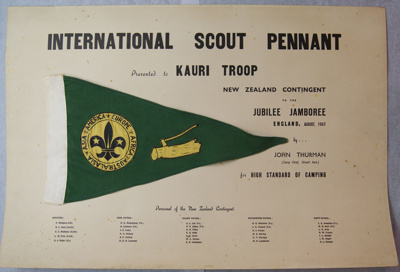 This troop was part of the New Zealand Scout contingent to the 9th World Scout Jamboree held at Sutton Coldfield and who based themselves at Gilwell after arriving by sea from New Zealand andbefore they could get on the site at Sutton Coldfield. Pennant was mounted on card and had the descriptive text added for display here in New Zealand, originally at Tatum Park before becoming part of the Museum's collection.